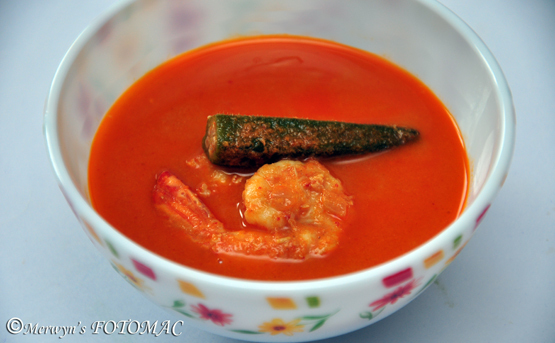 In every Goan home, you will always find fish curry rice & prawn curry rice as a regular & normal meal. Prawn & lady finger curry is something to be experienced in Goa. This curry is really very special as in Goa large lady fingers are grown & added to the curry. Besides, clay pots & coconut oil is used for cooking. 2 tbsps. dry Coriander Seeds or pwd. Water or Coconut milk as required. First, heat 2 tbsps. oil in a sufficiently deep & broad pot till hot. Reduce heat & sauté chopped onions briefly & then sauté the chopped tomatoes briefly. Transfer to a masala grinder/blender along with soaked chillies with the water, scraped coconut, coriander seeds, cumin seeds, turmeric pwd., ginger, garlic, tamarind paste & grind to a fine, thick & smooth paste. Transfer the masala paste to a bowl; rinse the blender & reserve the masala water to be used later to prepare the curry. In the same pot, add another 2 tbsps. of oil & lightly fry the lady fingers, about 2-3 mins. Drain & transfer to a bowl. Then fry the prawns briefly for about 2 mins. Do not over fry. Drain & reserve in another bowl. Now add the masala paste to the pot & fry till rawness disappears. Add the reserved masala water & more fresh water or coconut milk depending on the consistency of the curry you prefer. Give it a good stir; add bindi sol, slit green chillies & let it come to a boil. Add in the prawns & lady fingers. Stir gently & let it come to a boil. Reduce heat add a pinch of sugar & salt to taste; stir gently again & let it cook for about another 2-3 mins. Do not over cook the prawns & lady fingers. It is better to have the lady fingers slightly firm. Serve hot with steamed rice & fried fish or prawns on the side or with bread/pav/sannas. I have cooked this curry several times, but never tasted as good as when I followed your recipe.. it was awesome. Thanks A.Hilda for sharing your recipes.